Did you know that most caterers, restaurants and hotels charge a cake cutting fee which usually runs between $2-$4 per slice? A very popular alternative to traditional wedding cake is to have a small cake to cut and then serve cup cakes to your guests. It's a terrific alternative as well as a terrific cost saving measure. 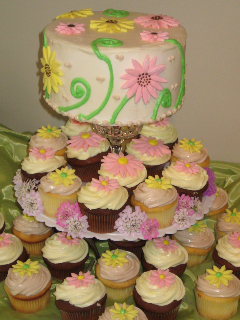 On top of that, our cakes are terrific and you can choose from a variety of flavors. Dynamic Cupcakes start at around $2.50 each. That's the cost of the cake cutting fee alone! Most cake vendors charge $5-7 per slice of cake. Save that money for something you can really enjoy. Terrific value! Terrific taste! That's what Dynamic Cupcakes is all about.